Key Difference: Full cream milk, is milk that is untouched or undiluted. Other than being homogenized, i.e. to make sure the milk doesn’t split, and pasteurized, i.e. to make sure that the milk is safe to consume, no other changes are made to the milk. In comparison, toned milk is buffalo milk that has been treated by adding skim milk, powdered skim milk and water to the milk. Milk is precious commodity. It is wholesome, provides a lot of necessary nutrients, and to top it all off it is delicious. Milk is available nearly everywhere, though it may differ in the types of milk available. 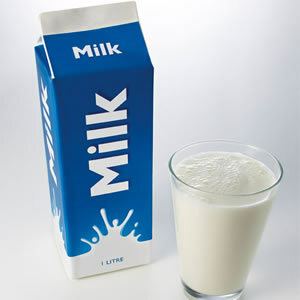 The most common type of milk, i.e. the one most commonly consumed is cow milk. The second most common is buffalo milk, followed by goat, sheep, camel, donkey, horse, reindeer and yak. In addition to these, there are is also milk that is artificially produced, rather than being sourced from animals, such as almond, soya, as well as rice. In addition to the various sources, there are many variants of milk available, starting from whole milk, skimmed milk, full cream milk, toned milk, 2% milk, and 1% milk among others. It is no wonder that these days it is confusing to choose milk, the options are no longer limited to milk or no milk, as they once were. This choice is further weighted by the fact that milk has gotten a bad rapport in recent years as being high in fat content and having too many calories. However, in this calorie conscious world, many people often forget the benefits of milk, such as the fact that is a great source of calcium and protein. Additionally, it also contains potassium, phosphorus, vitamin D, vitamin B12, vitamin A, riboflavin (B2), and niacin. This is why milk is often recommended as a nutritional addition to a well-balanced meal. In fact, reducing or limiting milk intake can lead to loss of bone density and other health problems. In addition, research shows that continuing to have milk does not interfere with weight loss. On the contrary, it ensures that the weight loss does not include bone density. 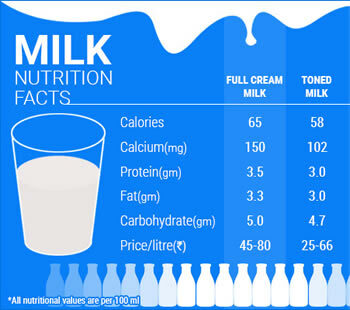 Yet it is true that milk can be high in fat and calorie intake. Nonetheless, according to nutritionists, this should not be a concern if the person is healthy and moderately active. However, in certain cases such as when the person is suffering from certain conditions, such as gout or high uric acid levels is on a low-protein diet for health reasons, or is unable to be active enough to burn the calories, then the fat and calorie in milk can be an issue, which is why there are so many variants to plain old milk. Full cream milk, is milk that is untouched or undiluted. Other than being homogenized, i.e. to make sure the milk doesn’t split, and pasteurized, i.e. to make sure that the milk is safe to consume, no other changes are made to the milk. It is almost as if it is directly from the source. However, this also means that it has full fat and calorie intake. In comparison, toned milk is buffalo milk that has been treated by adding skim milk, powdered skim milk and water to the milk. This tends to dilute the milk, thus increasing the quantity of the milk, while also reducing the fat and calorie intake per glass. The concept of toned milk was originally developed in India as a way of feeding more people with less milk. The benefit of toned milk is as previously stated, more quantity, less fat, less calories, while also incorporating the protein and calcium that is needed from the milk. The benefit of toned milk is that you can get all of the protein and calcium from the milk, while with a lower calorie and fat intake. Hence, all the benefits without the health concerns. This is the primary reason that people opt for toned milk over full cream milk, especially in urban areas, where people are already battling a sedentary lifestyle and don’t need additional fat and calorie intake to worry about. Still, there may be reasons when in certain cases people may prefer full cream milk over toned milk. The primary reason may be taste, as full cream milk tends to taste better than toned milk, which tends to taste more diluted than the full cream variety. Additionally, the fat in full cream makes it better suited for certain tasks, especially in cooking or baking, where the fat may be needed for texture or taste. Typically buffalo milk that has been toned down using skim milk, powdered skim milk, and water. Whole milk or full cream milk is milk as it, i.e. it hasn’t been manipulated in any way. Less Calories. 150 cal in one cup. More Calories. 285 cal in one cup. More Fat. Most fat as compared to all types of milk. 7-8% in Full Cream Buffalo Milk. 3.5% in Full Cream Cow Milk. Less saturated fats which can increase your levels of cholesterol. More saturated fats which can increase your levels of cholesterol. I read in another website that high calcium and potassium content in toned milk rathar than full cream milk. Which is true?